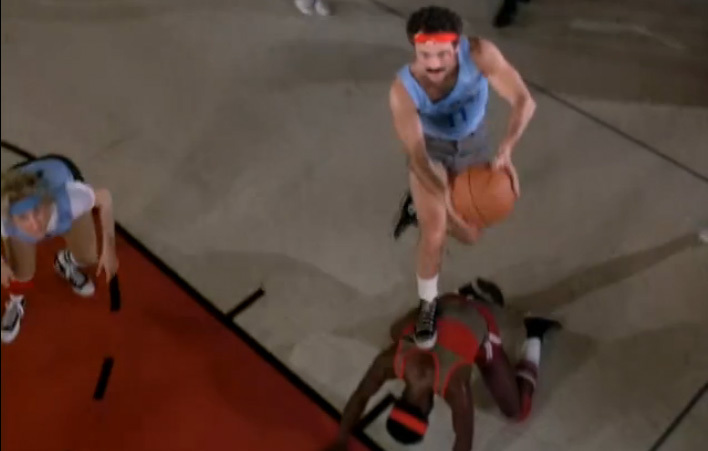 What’s the greatest fake basketball game ever put on a movie or television screen? Hickory High–South Bend Central? Cadwallader College–Nevada State? Baltimore East Side–Baltimore West Side? All are worthy contenders. But for me, the showdown between the cops of Hill Street Station and an all-star team composed of local gang members has them all beat. This little-known gem combines the best elements of those other iconic games — last-second drama, great shotmaking, over-the-line illegal play, gambling, gangbangers — and then it ups the ante with two thermonuclear heat checks: a cameo from David Caruso, and the most ridiculous final play ever put on film. This hardwood classic was shot for “Personal Foul,” a Season 2 episode of the groundbreaking police procedural Hill Street Blues. At the end of April, the full series was finally released as a DVD boxed set. Hill Street Blues’s importance in television history has been discussed everywhere. But the show’s contribution to the realm of fictional basketball has been less heralded, and it’s time to do something about that. 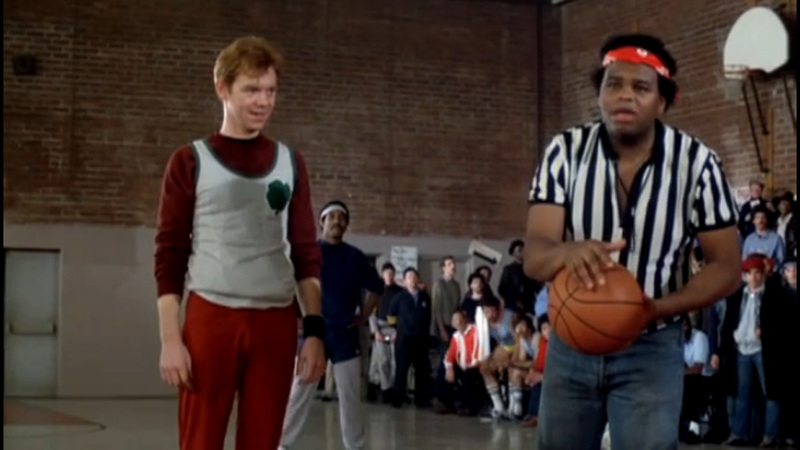 “Personal Foul” first aired on March 25, 1982. The Hill Street game featured one actual college basketball star — Michael Warren, an All-American guard who won consecutive national championships alongside Lew Alcindor at UCLA in 1967 and 1968. Warren played beat cop Bobby Hill on the show, and the writers couldn’t resist shoehorning his sports career into scripts whenever possible (Officer Hill won an intra-precinct boxing tournament in a later episode). But the captain has given his word, and the game goes on. He gives a pep talk encouraging his cops to keep calm and not get sucked into the hostile atmosphere. We then hard cut to Officer Joe Coffey (played by ex-NFL running back Ed Marinaro) reacting to a punch from a gang member by whipping the ball at him and then tackling him to the ground. Conveniently, Hill has pressing police business elsewhere and is forced to miss much of the game. Still, the cops — led by Coffey, the hulking pivot in ultra-short shorts; alcoholic swingman J.D. LaRue (Kiel Martin); shooting sensation Lucy Bates (Betty Thomas); and cigar-chomping serial biter Mick Belker (Bruce Weitz) — cannot understand why they are 11-point underdogs out on the street. After all, the gang all-stars are a ragtag assemblage of toughs in mismatched outfits and long pants. 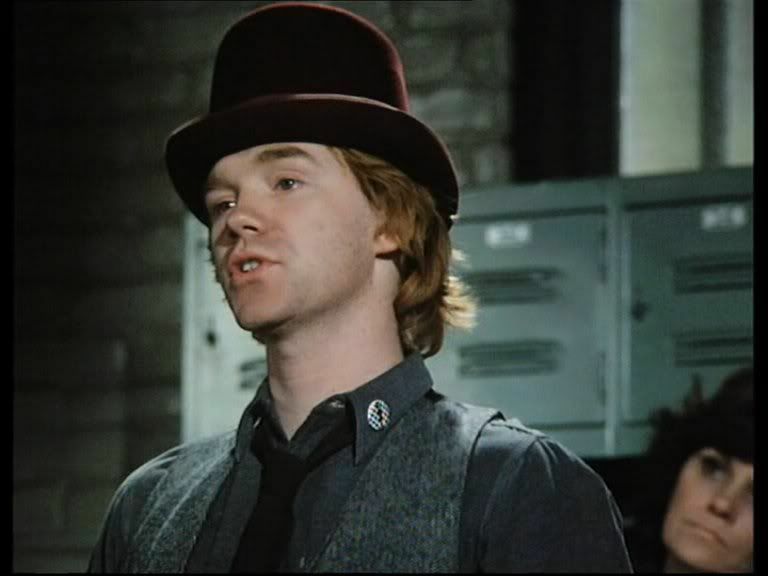 Emblematic of the team is Tommy Mann, the leader of an Irish gang called the Shamrocks and played with Gaelic gusto by a young Caruso, who was dressed like a character off a Gangs of New York–era box of Lucky Charms. In the game, Caruso is sent to the foul line by a personal foul for “biting.” Whacked-out on “ludes,” he barely manages to hit the backboard with his first attempt. 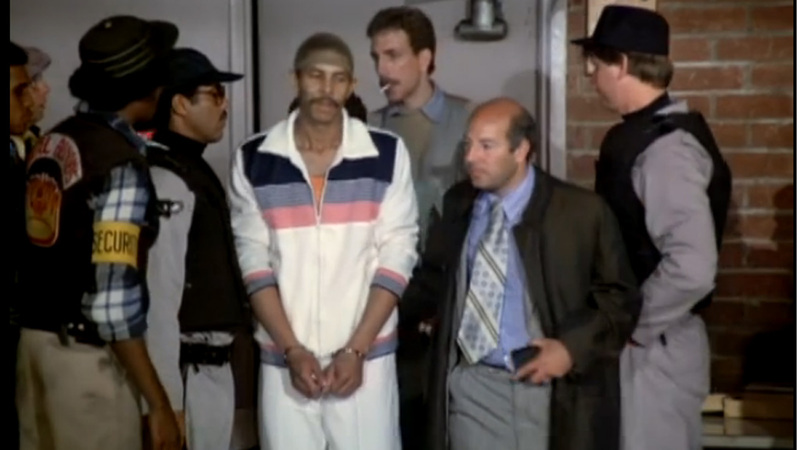 But even as the cops are laughing, the gang members’ secret weapon, Carl “The Pearl” Burlington, arrives fashionably late, complete with handcuffs (which come off) and a stylish hairnet (which does not). Burlington, it seems, has come directly from the state pen, where he is serving time for manslaughter. “That’s the 11-point spread,” Belker moans. Burlington was played by a former star guard for Stanford with the sensational name Wolfe Perry. Perry, now a high school hoops coach in the Bay Area, was drafted by the Utah Jazz in 1979 but didn’t make the NBA cut. Instead, he went back to high school, starring in the third season of The White Shadow as Teddy Rutherford, a little-remembered replacement for the graduated Coolidge, Thorpe, and Salami. Perry didn’t have many classic games on the Carver High hardwood, but he makes up for it against Hill Street. The cops lead 14-10 when the Pearl checks in, but that changes in a heartbeat. Mann manages to sink his second free throw. Burlington then pretends to jog upcourt on defense, only to instantly cut back to intercept a lazy pass and throw down a two-hand jam. And just like that, Hill Street is in trouble. Burlington immediately takes over with a dizzying array of midrange jumpers, spin moves, and power jams. He scores 10 points in quick fashion, countered only by a long jumper by Bates that is considerably aided by Belker grabbing the defender by his Afro to pull him aside. At halftime, the gang all-stars lead 36-21. The Pearl has led a 26-11 run, much to the enjoyment of the largely pro-gang crowd, including Jesus Martinez (Trinidad Silva), the curiously verbose leader of the Diablos, and an unnamed member of the Gypsy Boys (played by Guillermo San Juan and credited only as “Gypsy Boy”) who manages to sneak in a pistol despite being frisked thanks to some well-placed towels. Hill immediately drains a jumper, dimes Coffey for an easy 2, and then slices off a Coffey “screen” — actually an overhand right to the jaw of the Blood gang leader — for another bucket. They may be lawmen, but there are no rules between the lines, a fact proven moments later when Bates elbows an all-star in the chops, and the diminutive Belker uses the fallen man as a springboard to propel himself for an easy layup. Hill scores eight points and has three assists, and suddenly the cops trail just 60-59 with 16 seconds left. Hill Street’s nonexistent coach draws up the final play for Hill — after all, the precinct is named after him (OK, not really). Hill puts up the 20-footer as time elapses. 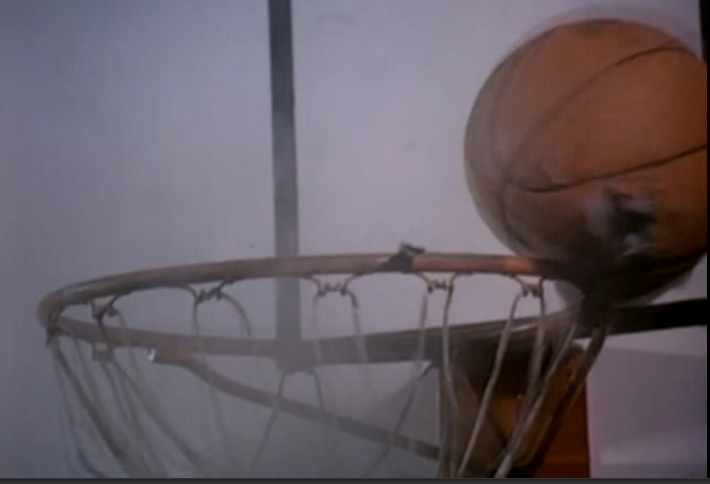 The ball circles the rim no less than five times in slow motion, taking an excruciating 15 seconds of screen time as all the cops emote (Bates gives her version of the Thomas Hill face). The good guys are about to pull off a miracle! And then Gypsy Boy pulls out his pistol and shoots — yes, shoots — the ball off the rim. No basket. Game over. All-stars win 60-59. The gangsters celebrate. Hill looks stunned. The good guys lost. No one seems to notice that strictly prohibited indoor gunfire has decided the outcome, in a rules violation blatant even by the standards of this game. It’s a moment that captures Hill Street Blues’s trademark blend of gritty drama and absurdist humor. 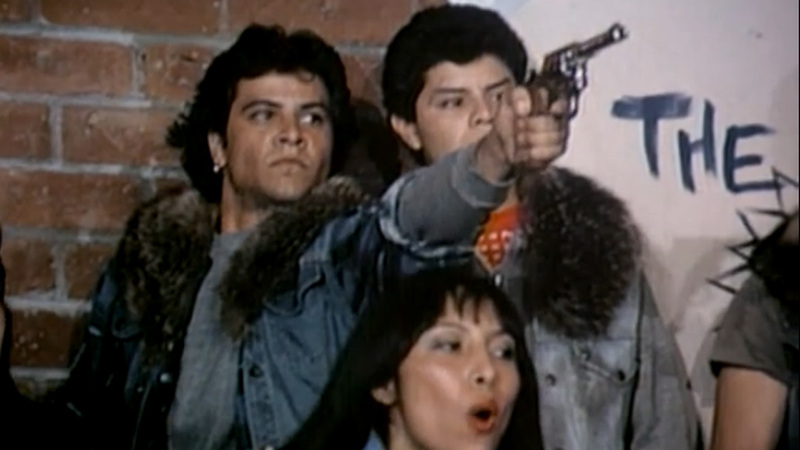 The original script, credited to four writers, including series creator Steven Bochco, called for Bobby’s shot to be blown out of midair, an even more ridiculous circumstance. But a serendipitous moment during filming led to the change. The director of the episode, David Anspaugh, won a Directors Guild of America award for his work behind the camera on this episode, even though it was only his second foray in the big chair. Among his exploits was what is considered the first use of a camera placed behind the backboard, now a staple on hoops telecasts but apparently pioneered by Hill Street Blues. “It just seemed like a natural place for an interesting shot,” Anspaugh told me when I called to ask about the episode. “You’re the first person to ever ask me about it in all these years,” he added, a personal tribute to my psychosis that nearly moved me to tears. Four years later, a battle-tested Anspaugh would again put basketball onscreen — this time to far greater fanfare, as the director of Hoosiers. While he told me it was coincidence that he happened to direct two basketball epics (as well as Rudy and The Game of Their Lives), the Hill Street Blues hoops experience had at least one direct effect on Hoosiers — Anspaugh held tryouts for the movie at the Hollywood YMCA, which was also the set for the cops vs. gang members game. Sure, Hoosiers is one of the greatest sports movies ever, and Jimmy Chitwood’s last-second shot to win the Indiana state championship was fantastic. 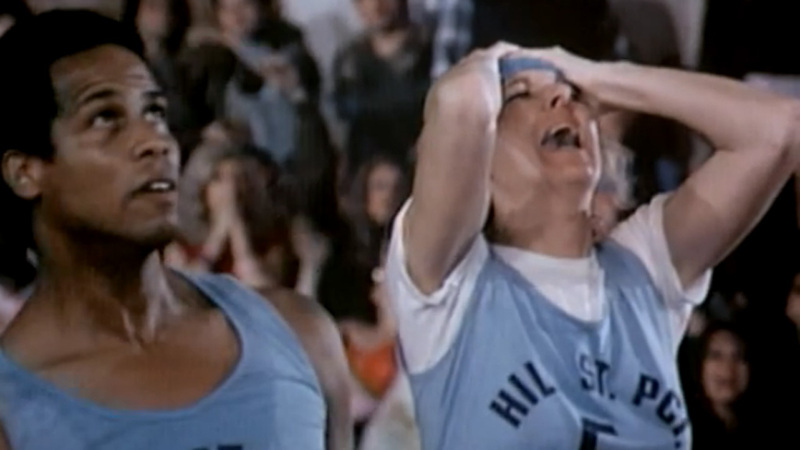 But wouldn’t it have been better if an anguished Chelcie Ross had opened fire with a hunting rifle and blasted Chitwood’s buzzer-beater halfway to French Lick? And if Shooter had been the lone witness, but his complaints were dismissed as the ramblings of the town drunk? Maybe that would have made it the best fake basketball game ever. Instead, it’s only no. 2.